SUNN O)))'s Downtown LA Rehearsal/Rifftape March 1998 will be getting a limited edition vinyl pressing from Southern Lord Recordings in honor of the label's 20th anniversary (released as a split label release with help from Stephen O'Malley's Ideologic Organ imprint). 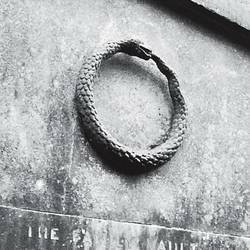 The Downtown LA Rehearsal/Rifftape March 1998 is among the earliest rehearsals from SUNN O))), recorded on cassette via boombox in their shared 1988 practice space with Goatsnake and the Melvins. It has a notablly raw sound and has since been mastered by Brad Boatright February 2018. In addition to the vinyl pressing, 2018's annivesary celebration on behalf of both the band and Southern Lord will also feature reisues of White1 and White2, with additional news on that project still to come. 4. M & D I.L.F.